Second best from start to finish, Buxton could have no complaints as they suffered a 3-0 defeat at home to Marine. The visitors performed consistently well throughout with a quality far above their starting 19th league placing. Needing victory from this second of four consecutive home fixtures to keep up the pressure on the top six clubs, the Bucks never really got going and looked increasingly out of sorts. By contrast the visitors set the tone early with penetrative attacks that opened up the home rearguard. As early as the third minute Theo Roberts was forced into a fine far-post save to deny Irwin, then the same visitor headed against a post only for team-mate Cummins, on loan from Curzon Ashton, somehow to put the rebound wide from a mere two yards. 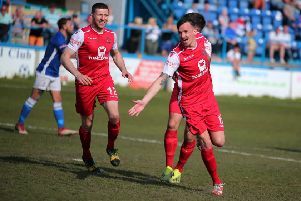 At first Buxton responded effectively with a Liam Hardy turn and shot that went close before he set up Ash Young for a firm ground shot that was deflected wide for a corner, from which Cummins cleared a Tom Dean header from the goal-line. However, such promise by the home side was largely not sustained as Marine profited from the strong corner-to-corner wind at their backs and took a 42nd-minute lead. A free-kick dangerously whipped in from the right was touched into goal by ex-Warrington midfielder, Hynes. With the strengthening wind accompanied by driving rain after the interval, the faithful were anticipating a Buxton recovery but it didn’t materialise as players who had impressed recently had a collective off-day. The influential Callum Chippendale was absent through injury, John Pritchard similarly had to withdraw, while the strikers and attacking substitutes couldn’t make an impact, so Marine enjoyed ample possession and were helped by defensive errors to net a brace of decisive goals inside four minutes. In the 74th-minute the usually so dependable Nico was pressured into a mis-directed back-pass latched onto by Irwin who netted confidently, then Mitchley pierced a square-looking defence to run on and also net convincingly. The visitors not only completed a third consecutive win but also added to the Mariners’ record of being comfortably the most successful club to visit regularly, now having won 21 and drawn nine of their 38 Silverlands matches since 1962. Buxton: Roberts, Roscoe, Brown, N De Girolamo, T Dean, Young (Oyibo), Sephton, Gee (Grayson), J Dean, Hardy, Pritchard (Coppin). Unused subs: Meade and Chippendale.